Ok, there’s no spinach in these, but they are tinted with green thanks to a special ingredient. 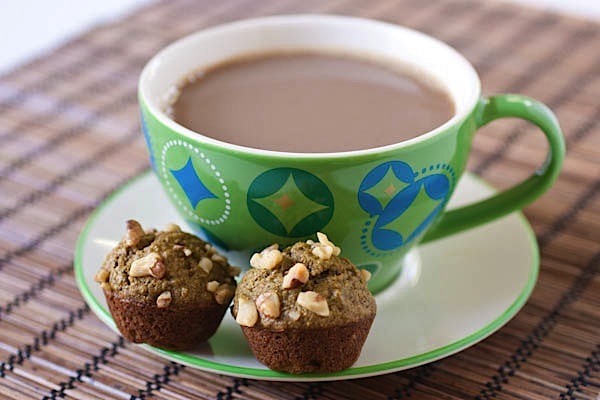 These Not So Sweet muffins have all the tastiness you’d expect from traditional banana nut muffins with a little twist – matcha green tea flavor. 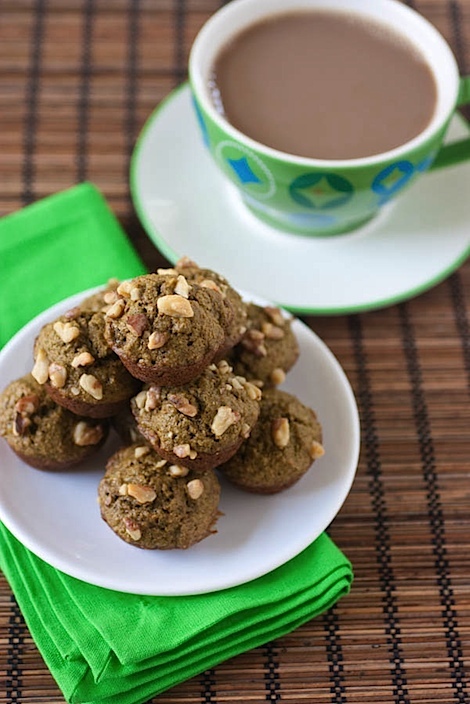 The matcha powder won’t overpower the muffins, but does add a little something extra. NOTE: I used some extra healthy ingredients that most people may not keep on hand. If you don’t have these ingredients, I encourage you to go buy one or two of them and try them out, but I’ve also added notes for substitutions in case you need them. Also, I didn’t mix the nuts into the mix because I like how they get toasty on top. You could probably mix in a bit of chopped nuts if you like your muffins extra nutty. Or omit the nuts altogether if you’d like. In a large bowl, combine both flours, matcha green tea powder, baking soda, and salt. Whisk to combine. In a separate medium bowl, cream together butter and sucanat. Blend in egg, bananas, and vanilla extract until well combined (but try to not overmix). Pour web mixture into dry mixture and stir to combine (try to not overmix). Using a mini ice cream scoop, fill mini muffin pans just over 3/4 full. Bake for 11-13 minutes or until edges just start to brown and a toothpick inserted in the middle of a muffin comes out clean. Let cool for a couple minutes before serving. I LOVE the green mug that has been in the past two posts, where’d you get it? These look wonderful! 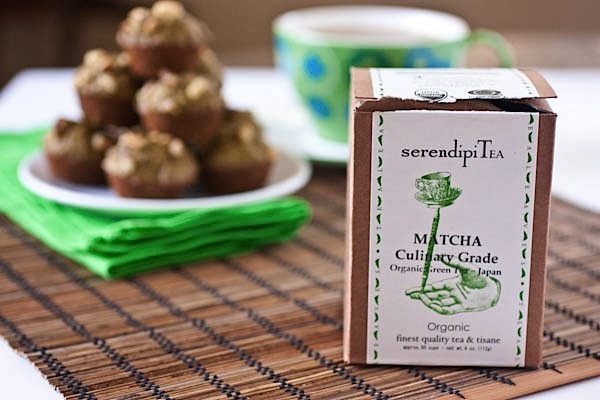 I love anything incorporating matcha, so I’ll definitely be giving these a try! The mini muffins are so cute! I don’t have all the ingredients on hand, but now I’m intrigued and kinda want to buy them just to give this recipe a try! I love the pattern on your tea cup and saucer! Matcha has such a clean taste to me… I bet these are divine! What a great combo of ingredients! What is the difference in using whole wheat flour versus whole wheat pastry flour? My neighborhood grocery does not carry the pastry flour so I may have to run to Whole Foods if it is a texture/taste difference.